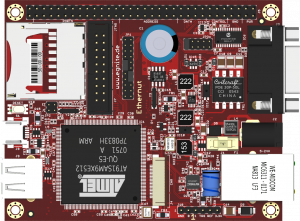 With the Ethernut 5 board the continuous development of the Ethernut family reached a new level. 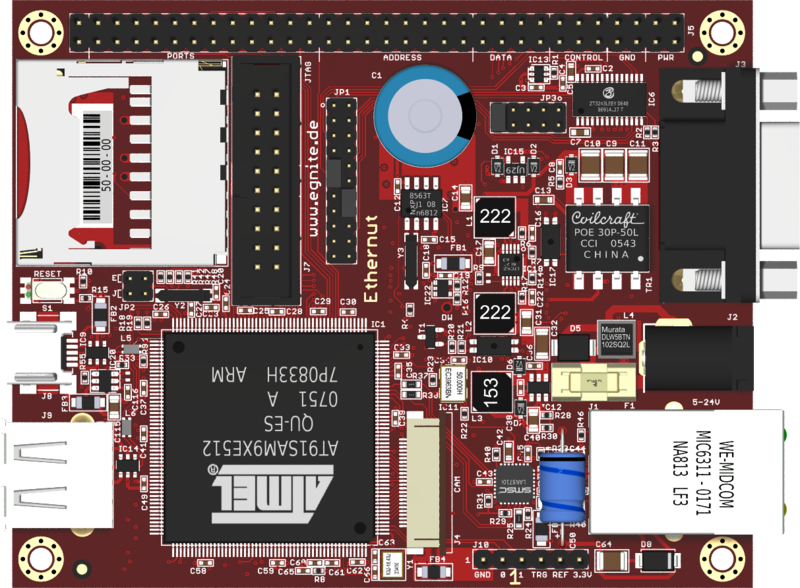 By using the same board geometry, this single board computer with its ARM9 CPU offers significantly higher performance and many more features than its predecessors. Atmel's AT91SAM9XE512 CPU provides a large number of peripherals, like 10/100Mbit Ethernet, USB 2.0, CMOS image sensor, SDcard/SDIO/MMC, IrDA, I2S, ADC, TWI or SPI. 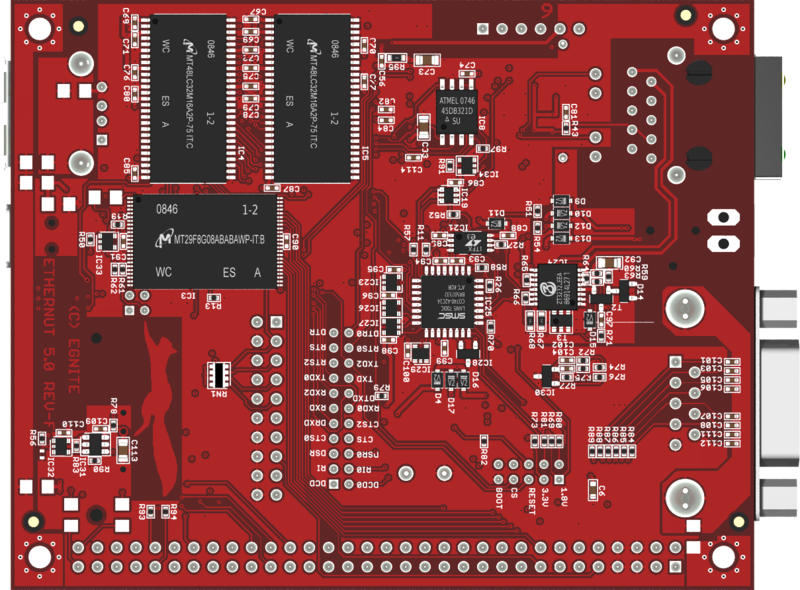 Like other members of the Ethernut family, the board provides an extension connector for attaching additional hardware. 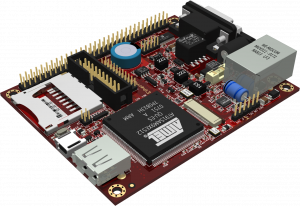 Hence it is suitable for prototyping your own hardware design or being directly integrated in to your final product. The integrated Flash memory can be protected against external access and is complemented by 1BByte NAND Flash, 128 MByte SDRAM and 4MByte serial Flash. This may be further increased by using the MMC/SDcard socket. For power supply, a conventional DC input of 7-24V is available. Alternatively the USB or Ethernet cable may be used as well. 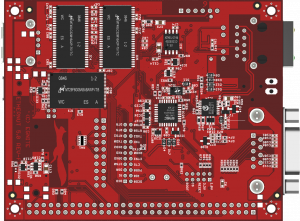 Flexible power management is done by a dedicated ATmega168 CPU. The real time clock is backed up by a double layer capacitor. Our 100% in-house quality control guarantees a continuous high level of reliability. Application development is done in the high level programming language C, using free GNU tools. An active Open Source community created Nut/OS, a cooperative RTOS with TCP/IP stack specially designed with low memory consumption in mind. The well documented and tested code provides a convenient, portable API. Programmers familiar with C for desktop PCs will soon feel comfortable with its standard C library functions. Although well pre-configured for Ethernut 5.0, an easy to use graphical interface is available on Linux, Windows and OS X PCs to adapt the system to special requirements with just a few mouse clicks. In addition to Nut/OS, the Linux operating system is available for Ethernut 5. The board support package based on the Ångström distribution. Several companies with many years of experience in Nut/OS software and Ethernut hardware offer commercial support. Furthermore, mailing lists are an important element of this Open Source project, where developers use each others experience to help solving respective problems. All Nut/OS target source code as well as the hardware design are published under the permissive free BSD License and can be used in commercial products for any purpose without license fees. In opposite to some other Open Source license models, it does not require to publish your own source code enhancements. Development tools and the Linux operating system are published under the GNU Public License Version 2.
features which are connected to the integrated power-manager. Turtelizer 2 you additionally need to install the following driver. Windows XP, Server 2003, Vista, Server 2008 and Windows 7.